Abbie Dvorak receives her award from Purina representatives for her win aboard Paper or Plastic in the $1,500 Purina Hunter Derby. Chrissy Hollnagel won the $2,500 Walsh Products Mni-Prix on Can You Dig It at the Wisconsin Equine Derby Weekend. 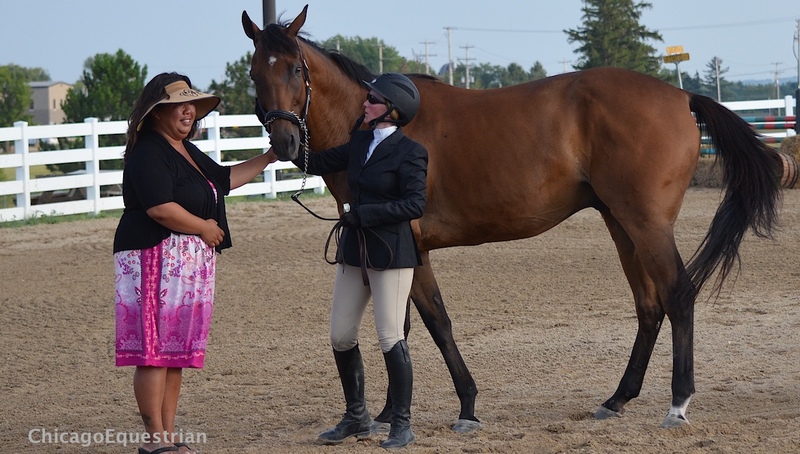 West Bend, WI - August 15, 2015 – Hunter competition took to the main ring of the Washington County Fairgrounds as the Wisconsin Equine Derby Weekend, presented by Old Seoul Equestrian, began day two of the special event weekend. On Friday, riders participated in training sessions by top trainers Maggie Jayne and Haylie Jayne-Rolfe of Elgin, IL. Now as judges, the two clinicians scored hunter rounds to see who would take the top prizes in the Hunter Derby classes. Horse and rider combinations jumped around a park-themed course designed by Brenda Mueller, complete with park benches, lamp-posts, hedges and even a few rabbits. Special thanks to Doug Fromm for the beautiful jumps and great landscape. Hall Saddlery representatives award Stephanie Trembly and Dark N Diversified with the top prize in the $500 2'3 Hall Saddlery Hunter Derby. 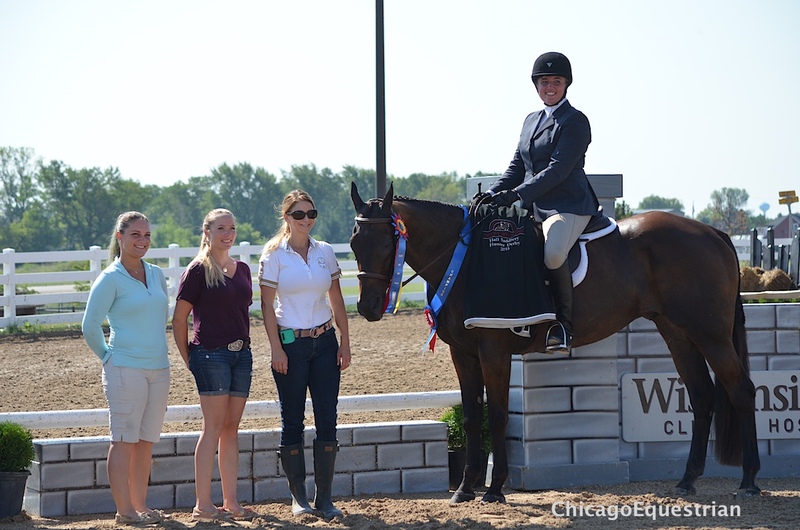 Starting off Hunter Derby Day with a win in the $500 2'3" Hall Saddlery Hunter Derby sponsored by Hall Saddlery of Sussex, WI, was Stephanie Trombley of Lake Geneva, WI, with her 19-year-old quarter horse, Dark N Diversified. 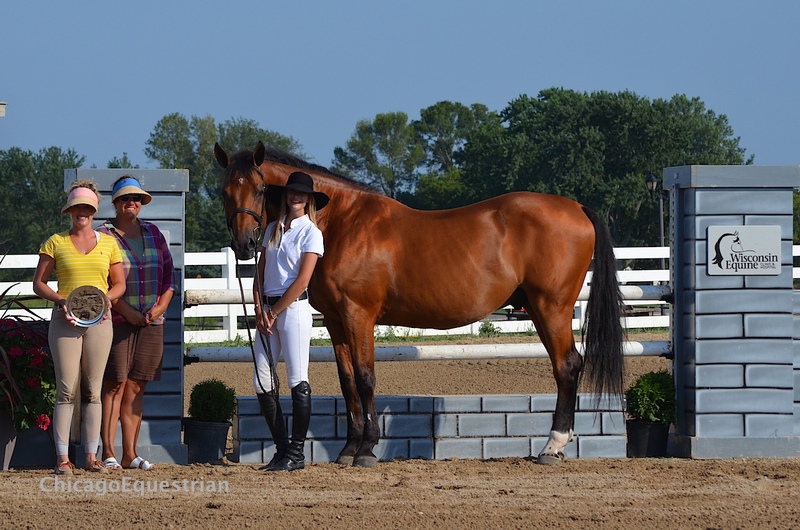 Trembly rides with Prestige Sport Horses and Elizabeth Rietesel-Karlen in Hebron, IL. "I came last year and didn't do so well so I came back for redemption!" laughed Trembly. "I like all the parties here and how everyone comes together. You don't really compete against each other but you just come together to have fun." Trainer Kelly Wampler and Carrie Obrecht with Nostalgia accept their award from LeCheval Tack Shop owner Mary Pratt. 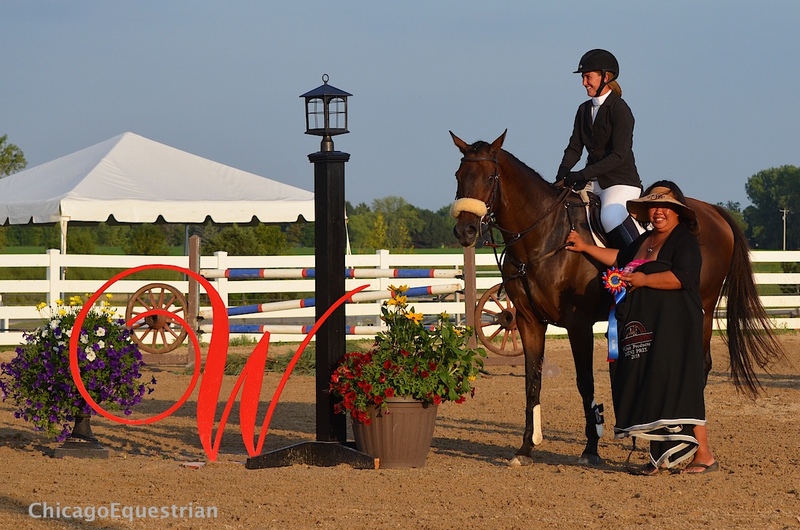 Winning the $500 2’6” Le Cheval Hunter Derby sponsored by LeCheval Tack Shop, Oconomowoc, WI, was Carrie Obrecht, Milwaukee, WI, with her mount, Nostalgia. Obrecht rides with North Haven Farm and Kelly Wampler in West Bend, WI. Courtney Hayden-Fromm presents the award to Marissa Scaffidi and Kentucky for the $1,000 Hope Memorial Hunter Derby. Marissa Scaffidi won the $1,000 Hope Memorial 2’9”-3’ Hunter Derby with Kentucky. Courtney Hayden-Fromm sponsors the class in memory of her all time favorite hunter, Hope, whom she won numerous championships on. Hayden-Fromm gives back to the community not only by her sponsorship and running the event, but also gives a portion of the proceeds to various charities. 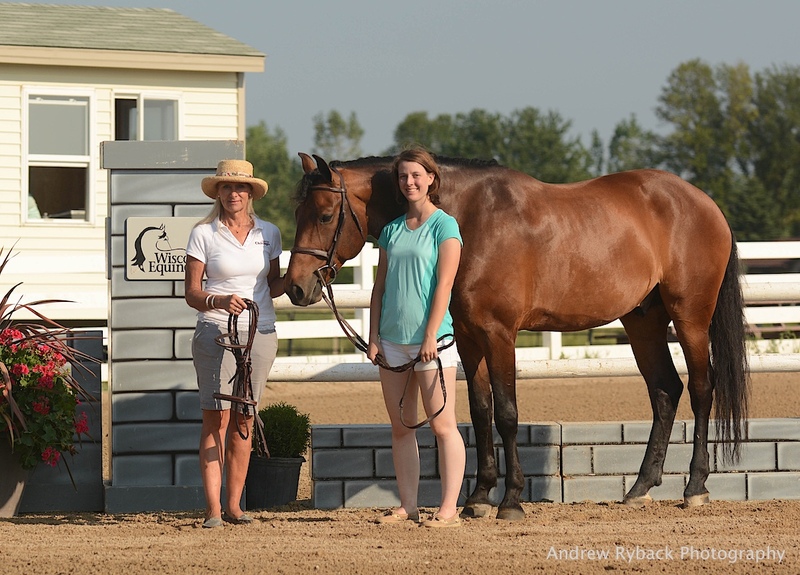 Winning the $1,500 3’6” Purina Hunter Derby was Abbie Dvorak of Madison, WI, with Paper or Plastic, who also clinched The $100 Roc USA Incentive Award, sponsored by Nancy Whitehead and Natalie Prentice for the highest combined Hunter Derby Score by a non-thoroughbred. 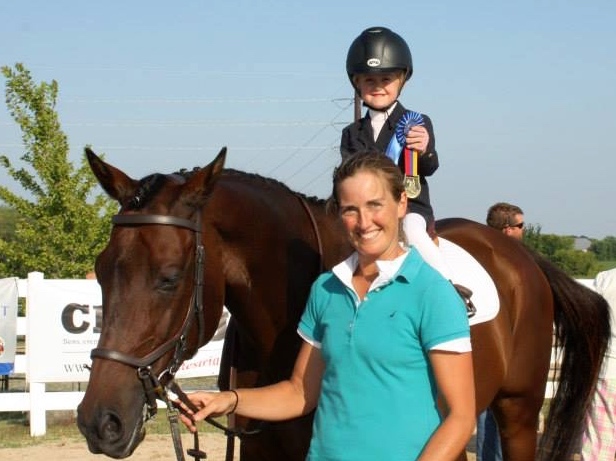 Roc USA is one of the country's top warmblood breeding stallions, creating the new generation of top show horses. Dvorak with her mother, Ginny, own and run Breakaway Farm in Oregon, WI. Ellie Trepte and Taylor received the overall highest score in the classic round from Abbie and Ginny Dvorak. Several special awards were also earned by top scoring riders. The High Score Hunter Classic Round sponsored by Breakaway Farm, Madison, WI, went to Ellie Trepte and Taylor with an 85. 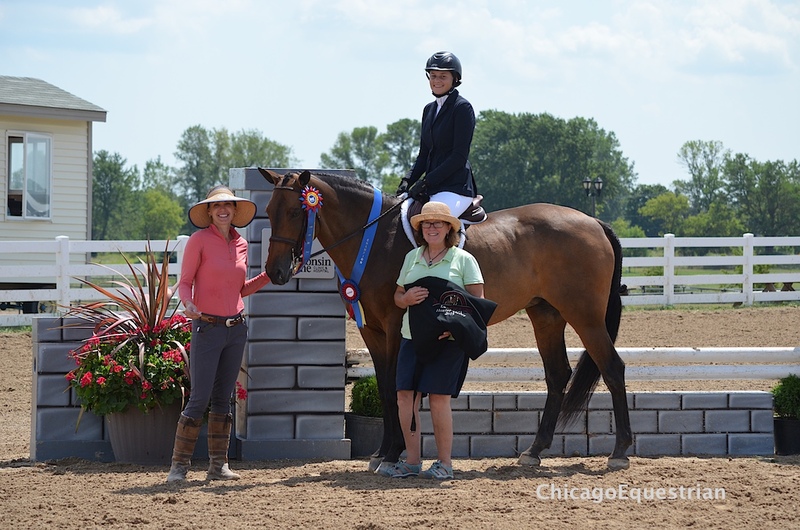 Brenda Mueller/Chicago Equestrian presents Emily Anderson and Unexpected Journey with the award for the Overall High Score Handy Round. Abbie Dvorak and Emily Anderson's Unexpected Journey won the High Score Handy Round sponsored by Chicago Equestrian, taking home a SmartPak bridle. Dvorak's handy round score of 84 earned her the title. Courtney Hayden-Fromm presents A Finer Thing $100 Incentive Award to Heather Hunt and her Jacks in the Box. A Finer Thing $100 Incentive, sponsored by Courtney Hayden-Fromm, was awarded to the highest combined Hunter Derby Score by an off the track thoroughbred, which was earned by Heather Hunt and Jacks in the Box. In addition, the event is recognized by Chicago Equestrian as a double point derby event in the series. The 2', 2'6" and 3' Hunter Derby sections will receive double points for their placings toward the series awards. 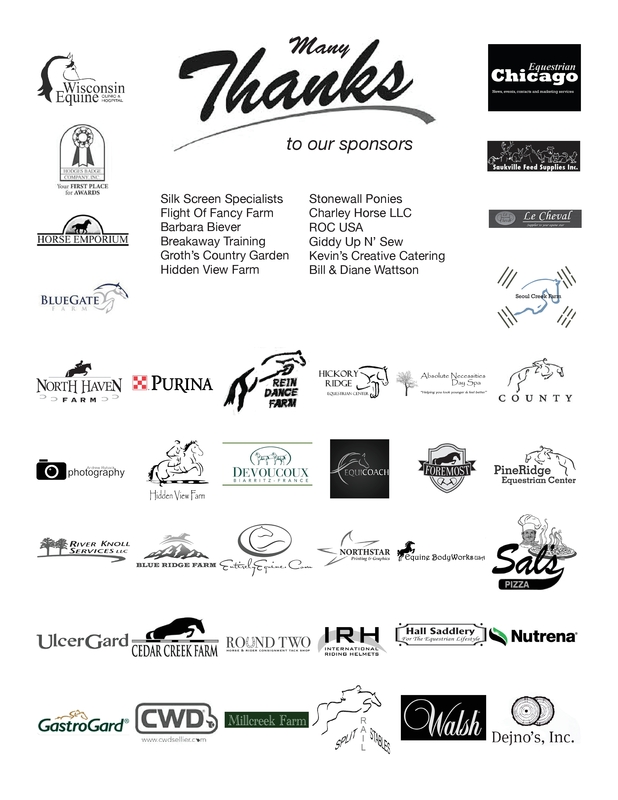 The day was topped off with great food for the exhibitor's party, sponsored by Wisconsin Equine Clinic & Hospital, complete with a full bar sponsored by Manchester Farm and Old Seoul Equestrian, as the $2,500 Walsh Products Mini Prix took place. The large crowd of spectators cheered on the riders as they tackled the ten jump track. The fastest clear round of the day belonged to Chrissy Hollnagel and Can You Dig It. Ellie Trepte and Lance Williamson's Luminous had the fastest time of the night but had the first jump down. Hollnagel took the third place spot with her second ride, Saki. Exhibitors were treated to coffee and donuts courtesy of Blue Gate Farm and could take an afternoon break to enjoy the ice cream social sponsored by Stonewall Ponies, Ixonia, WI, or shop vendor row. 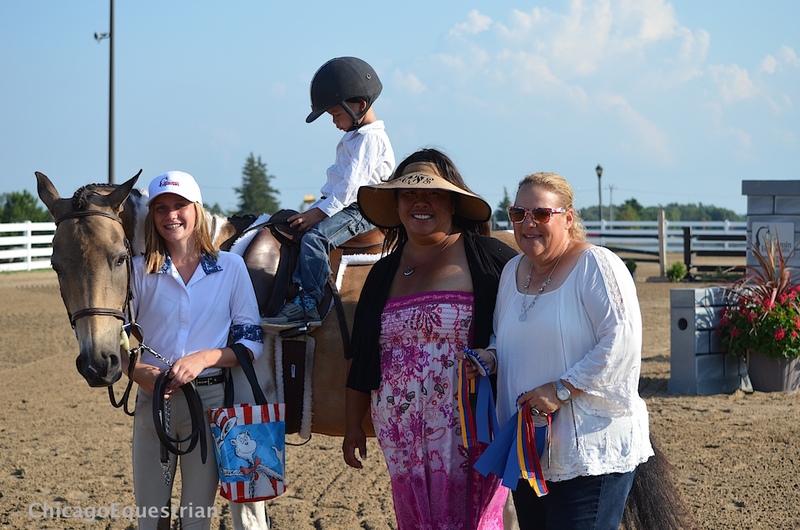 The day included the Barbara Biever lead line class and a Parade of Champions. Helen Biever presented awards to the lead liners, pictured above with Courtney Hayden-Fromm and her son, Carter. New in 2015, Equestrian Lifestyle Photography by Julian Johnson was on hand to give all competitors a mini make up session and also an opportunity to win a private photo shoot! Andrew Ryback Photography was busy capturing the fantastic images of the day's events. Visit www.andrewryback.com to see their amazing photos and place orders. Sunday is Jumper Derby Day with the $1500 Blue Gate Farm 3’6” Jumper Derby, the $1000 Split Rail Stables 2’9” – 3’ Jumper Derby, the $500 North Haven Farm 2’6” Jumper Derby and the $500 Blue Ridge Farm 2’3” Jumper Derby. Stop by to share in the fun. For more information, please vist www.oldseoulequestrian.com. Special thanks to the sponsors who make this event happen.